Preheat oven to 375 degrees. Cook lasagna noodles according to package directions. Cool in large bowl of cold water, set aside. Saute onion and red pepper with 3 T. butter until tender, about 5 minutes. 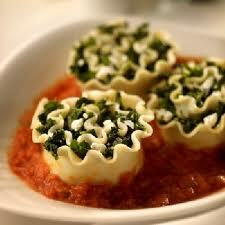 Combine spinach, onion, red pepper, 1 1/2 c. mozzarella cheese, ricotta cheese, 1/2 c. parmesan cheese and egg, set aside. Melt 1/2 c. butter in saucepan. Sift in flour, add pepper and salt. Stir in milk and cream and remaining parmesan cheese. Bring to boil, stirring constantly. Boil and stir until thick. Remove noodles from water, pat dry with paper towel. Spread about 1/2 c. spinach mixture over each noodle. Roll up jellyroll fashion starting at short end. Spread a small amount of sauce on bottom of buttered 2-qt. rectangular baking dish. Place rolls in dish. Spoon remaining sauce over roll ups. Sprinkle with remaining mozzarella cheese. Bake 30-35 minutes or until hot and bubbly.